Our family has a yearly tradition of driving up to the top of Mt. Spokane, where my son and I like to climb on the huge boulders. 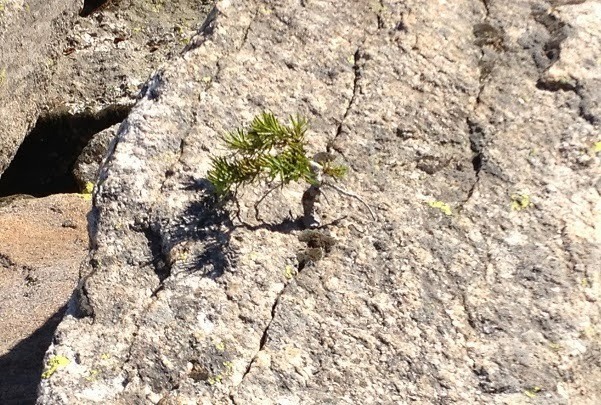 Our usual path takes us past this tiny little sapling, which has taken root within the crack of a boulder. We've seen it for several years now, and it never seems to get any bigger, yet it keeps on keeping on, through winter snows and summer heat. It reminds me of the parable of the sower, found in all three synoptic gospels. And he spake many things unto them in parables, saying, Behold, a sower went forth to sow; And when he sowed, some seeds fell by the way side, and the fowls came and devoured them up: Some fell upon stony places, where they had not much earth: and forthwith they sprung up, because they had no deepness of earth: And when the sun was up, they were scorched; and because they had no root, they withered away. And some fell among thorns; and the thorns sprung up, and choked them: But other fell into good ground, and brought forth fruit, some an hundredfold, some sixtyfold, some thirtyfold (Matt. 13:3-8).